The triglyceride level is a blood test to measure the amount of triglycerides in your blood. Triglycerides are a type of fat. Your body makes some triglycerides. Triglycerides also come from the food you eat. Extra calories are turned into triglycerides and stored in fat cells for later use. If you eat more calories than your body needs, your triglyceride level may be high. 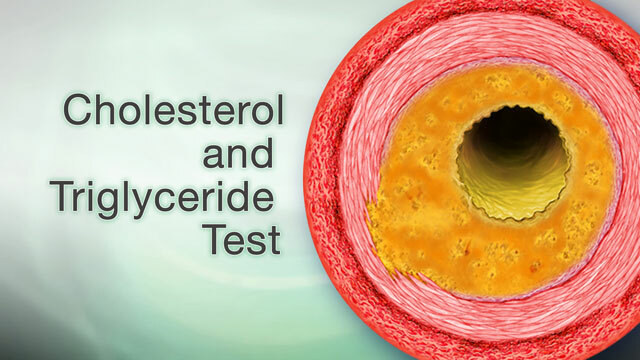 A test for high blood cholesterol levels is a related measurement. You should not eat for 8 to 12 hours before the test. Alcohol and some medicines can interfere with blood test results. Make sure your health care provider knows what medicines you take, including over-the-counter drugs and supplements. Your provider will tell you if you need to stop taking any medicines before you have this test. Triglycerides are usually measured together with other blood fats. Often it is done to help determine your risk of developing heart disease. A high triglyceride level may lead to atherosclerosis, which increases your risk for heart attack and stroke. A high triglyceride level may also cause swelling of your pancreas (called pancreatitis). Overall, the treatment of elevated triglyceride levels focuses on increased exercise and changes in the diet. Drugs to lower triglyceride levels may be used to prevent pancreatitis for levels above 500 mg/dL. Pregnancy can affect test results. Chen X, Zhou L, Hussain MM. Lipids and dyslipoproteinemia. In: McPherson RA, Pincus MR, eds. 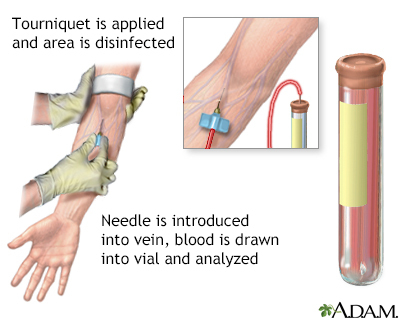 Henry's Clinical Diagnosis and Management by Laboratory Methods. 23rd ed. St Louis, MO: Elsevier; 2017:chap 17. Stone NJ, Robinson JG, Lichtenstein AH, et al. Treatment of blood cholesterol to reduce atherosclerotic cardiovascular disease risk in adults: synopsis of the 2013 American College of Cardiology/American Heart Association cholesterol guideline. Ann Intern Med. 2014;160(5):339-343. PMID: 24474185 www.ncbi.nlm.nih.gov/pubmed/24474185.